At the beginning of December, LudoBites 3.0 at Royal/T debuted with considerable fanfare. 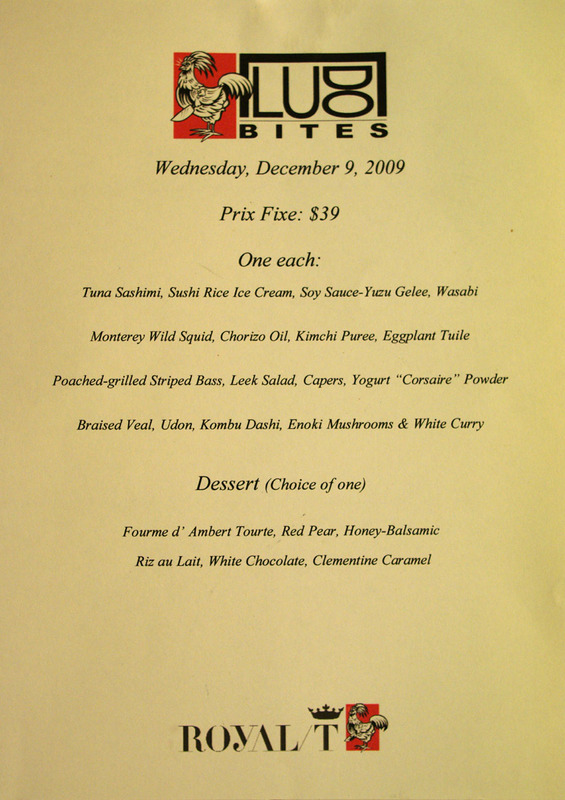 Originally, I was planning on bookending the limited 13-day engagement--visiting on the first and last days--in order to experience the evolution of the menu over its brief run. Thus, this return visit came unexpectedly, and was at the request of one of my long-time readers. This meal is particularly notable, however, for occurring on what Krissy deemed the "worst night ever." The kitchen had started the evening one cook down, which was crippling enough. But then, at approximately 7:30, the unthinkable happened: Ludo's Sous walked out in the middle of service, apparently after getting into a spat with the chef. This plunged the kitchen into disarray, with Ludo and company scrambling to scrap the regular à la carte menu and replace it with a five-course prix fix. 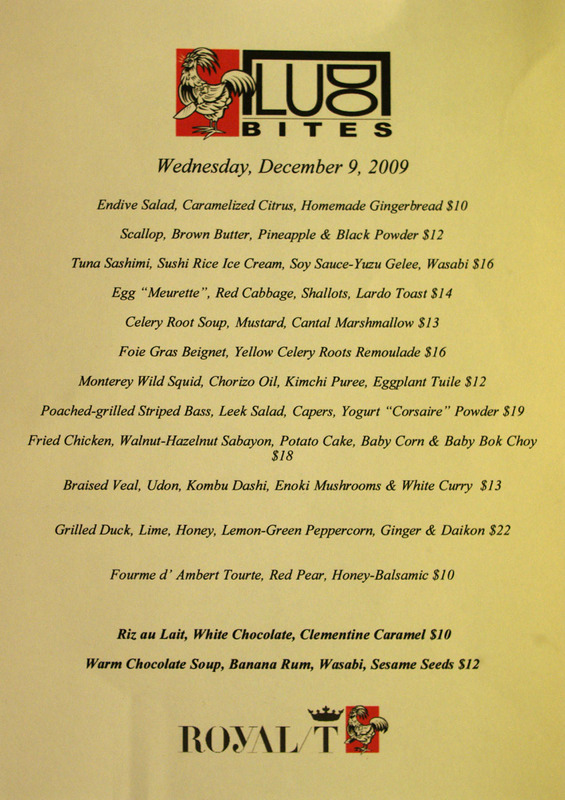 And here we see the menus: before and after; click for larger versions. Fortunately, we had gotten in our selections from the full menu just prior to the kitchen chaos, and were served pretty much everything that we wanted save for the duck. From what I gather, the people who arrived half-an-hour later fared far worse, as even the prix fix was up in the air: the squid was superceded by scallop; the bass vanished as well, replaced by a duck and mole dish; the Fourme d'Ambert Tourte turned into actual Fourme d'Ambert; and the Riz au Lait transformed into a chocolate mousse. As previously reported, this iteration of LudoBites now offers a reasonably-priced wine list. 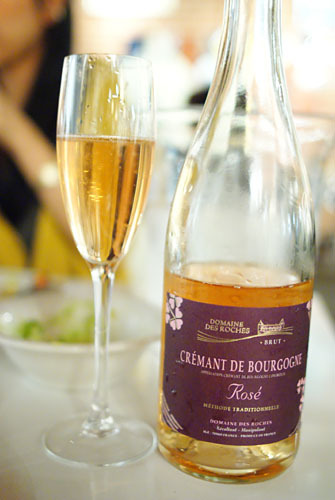 Fans of the bubbly stuff, we chose the Domaine des Roches Cremant de Bourgogne Rosé [$36]. Made from 100% Pinot Noir, the sparkler was a pleasant surprise to both of us: weighty yet effervescent, with lovely strawberry flavors over a firm mineral base, finishing with a touch of toastiness. Quite nice. We started with a repeat course from my last visit. 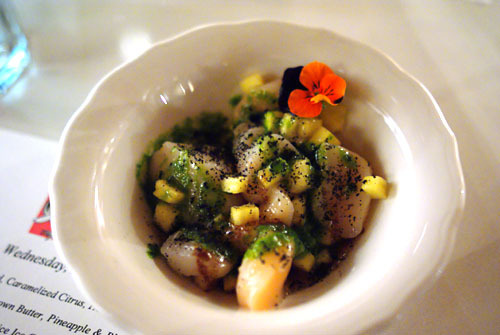 Compared to before, the scallops here were more substantial, "meatier," and more pronounced in flavor. They really took center stage, strongly interacting with the sweetness of the fruit, while the squid ink powder provided a tempering element. 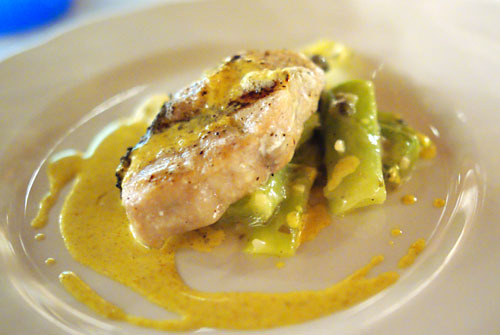 Next up was an item that recalled a similar dish that I had on my very first LudoBites visit. 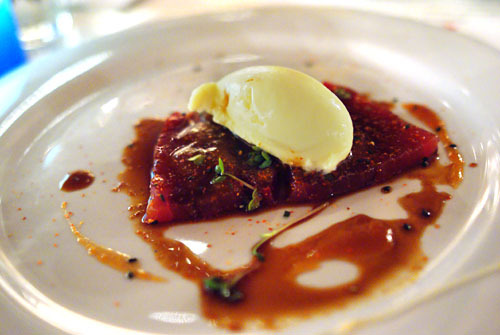 The dish starts with four slabs of carnelian-hued maguro, dressed in a soy-based glaze. Taken alone, the tuna was clean, delicate, and supple, but overpowered by the sauce. Thus, the "rice cream" was absolutely key; it took on the role of shari in nigirizushi, simultaneously moderating and countering the other elements in the dish to form a harmonious, unified amalgam of tastes and textures. 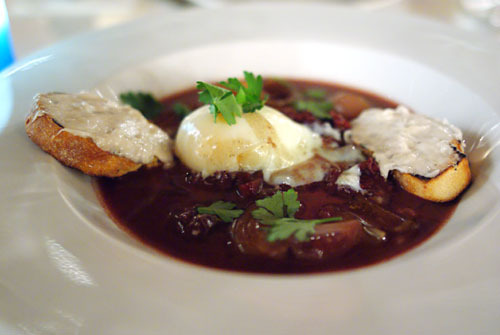 Here's a take on the classic French country dish Oeufs en Meurette, traditionally poached eggs in red wine. Expectedly, the star of the show here was the deftly poached egg. Still soft and runny, it added a nice creaminess that offset the tart acidity of the red cabbage soup. The two pieces of toast, meanwhile, were topped with pork fat, adding a palpable weight to the dish. Next we have one of my favorites of the night. The bass itself was beautifully cooked, to be sure. 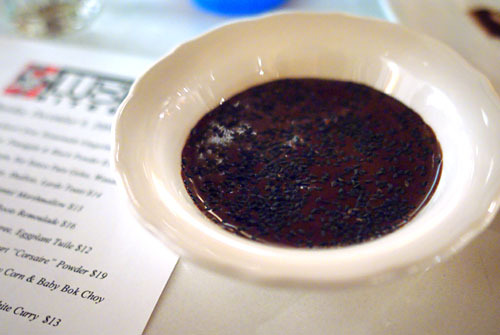 However, what elevated the dish was the use of curry powder, specifically the Poudre Curry Corsaire, created by noted spice expert Olivier Roellinger. An appealing commixture of coriander, fenugreek, ginger, and turmeric, among other spices, the powder lent an overarching piquancy to the dish that did a great job in setting off the flavor of the bass. Nearly as important as the curry was the use of leeks, which contributed a sharp, bitter vegetal tang. Perhaps the most hotly-anticipated item of the night was the return of Ludo's fried chicken (affectionately known as "LFC"). Note that none of the advertised accompaniments were present--a result of the aforementioned Sous Chef walking off without doing his prep work. Naturally, Krissy assured us that the course would be comped. 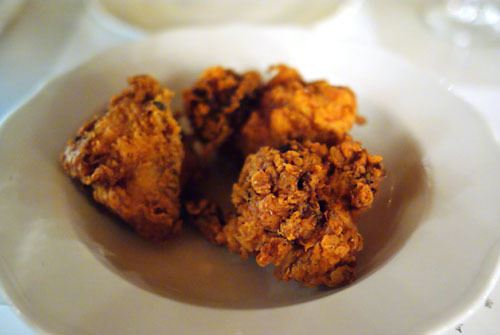 Absent accoutrements notwithstanding, this was clearly some of the best fried chicken I'd ever had: succulent and heady, with a lovely chicken-y sapor, all wrapped up in a crispy, crunchy, stupendously sapid skin. I'll take a 12-piece bucket to go. The Fourme d'Ambert tart has been one of the few constants on the new LudoBites menu it seems, and we weren't even supposed to have it tonight. See, we didn't actually order the tourte, but it ended up arriving at our table anyway, a result of the aforesaid pandemonium. Once again, Krissy reassured us that we would not be charged for the dish; and in fact, the entire meal was subsequently comped as a result of the kitchen nightmares on this night. In any case, last time, I loved its flaky crust and characteristic blue cheese flavor, as well as the sweet contrast provided by the pear. 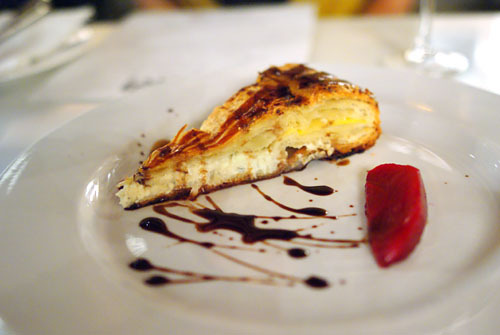 Such was the case again, though the tart itself was somewhat "fluffier" tonight--not a bad thing, mind you. 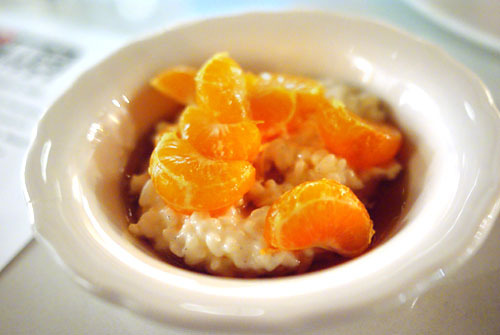 Our first dessert consisted of a simple rice pudding, tarted up with chocolate and caramel, and topped with clementine segments. I enjoyed the fruit, but felt that the rice didn't quite complement the sweet yet tangy citrus. The caramel helped, but wasn't enough for me. Finally, we closed with a most fascinating dessert. Taking a large swig of the soup, I first noted plenty of bittersweet chocolate on the attack, but the midpalate turned much weightier, imbued with the fruity essence of banana. The finish was spicy with the burn of wasabi, and the heat seemed to only to get stronger with the passage of time. And if it wasn't already interesting enough, the sesame added a bit of nuttiness into the fray, and gave the potage an additional textural element. Despite the clutter and confusion, the muss and mix-ups, the meal turned out surprisingly well--the food was mostly on point, while service and pacing weren't really too bad either. It was a far from perfect night, but Ludo and Krissy did do an admirable job in trying to save a sinking ship. Word is that the LudoBites team is already working on getting a replacement chef, so hopefully everything will be in place when I return for a final meal on the 22nd. Even on their "worst night ever", the food still looks remarkably delicious and, from the sounds of it, didn't suffer much in execution either. Kudos to Ludo and Krissy for pulling through. Gorgeous! Am craving that DARN chicken now. 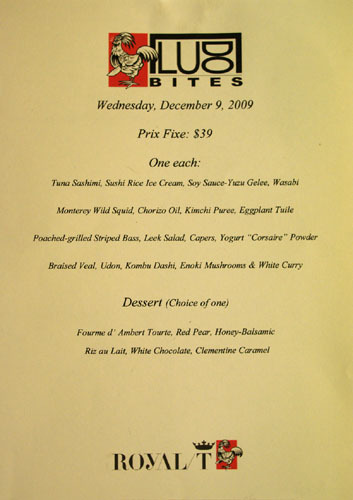 Good news is that they are back to an a la carte menu. I'm excited to try the fried chicken. Hopefully they'll have it on the menu tomorrow! Thank you, Food Digger! I go Monday and would prefer a la carte! I've heard nothing but bad things about this event. mostly how abusive Ludo has been to the people that work there - as you pointed out. ^Well, I can tell you a friend of mine got hired on as a cook. I'll take a first person account of what you said, but it seems like Kevin enjoyed his meals. You shouldn't talk trash if you have nothing to back it up. ooh the warm chocolate soup with wasabi sounds wonderful! I don't think I've visited your site before, very nice photos. @Anonymous I actually have a friend sous cheffing for Ludo right now. He's had nothing but positive things to say about the experience. Linden: Yeah, really the kitchen chaos wasn't a huge problem for us. However, I've heard that others were not as fortunate. Will: Yup. Hopefully the chicken will still be there on closing night. Gotta try it as it was intended! Anon: Interesting. Can you provide some specifics? Vinh: Who's the friend? Is it someone I know? Food Hoe: Thanks! And yes, the soup was quite special. Linden: Are you talking about Austin?